Today, Sunday is part of this weekends limited passenger rail service in Orange County. Therefore, today's adventure will take place in Griffith Park, in the Los Angeles area. The morning started with me driving to Santa Ana to pick up Chris Guenzler. From there we took I-5 north to LA, then past Dodger stadium and then the MetroLink yard to the 134 freeway. Heading west on the 134, we took the Zoo Dr exit. After exiting the road dead-ended with only right or left turns as an option. As neither Los Angeles Live Steamers nor Travel Town Museum were listed on the sign directions, we chose the left turn and went south on Crystal Springs Dr. past several nice public golf courses. After a nice Sunday drive through the park we found our first train ride, although not a planed venue but an unexpected nice surprise. With a twenty minute wait till the first train ride, we had time time to look around. We found the restrooms and then the pony rides. 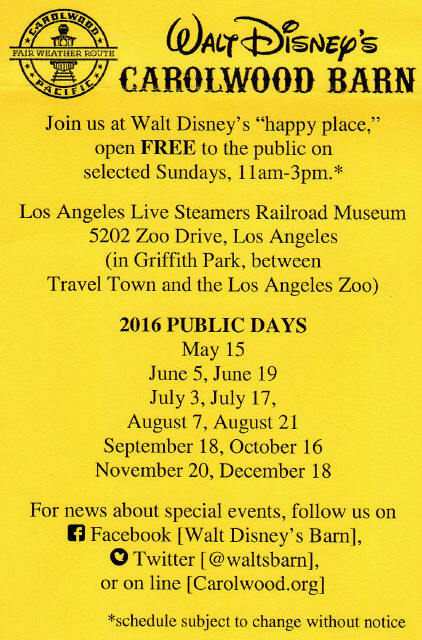 For more information on children's pony rides click here: Pony rides in Griffith Park. Click back button on your browser to return to this page. When the ticket office opened we bought our tickets and were ready to ride. It's never too early to start training them. This locomotive and its brother unit the Courage were built in Oregon in 1993 to a design by our chief engineer, Gene Gustavson. They are modeled after the narrow gauge locomotives that worked the timber and mining areas of the West during the early part of the century. This unit has identical power as the Colonel Griffith. A look back at the recently departed station. Located near Los Feliz Blvd and Riverside Drive at the South end of Griffith park, GPS Railroad occupies a location where miniature trains have operated since the late 1940's. The earliest record we have of a train operation begins in 1948 but there is some evidence that a train was there in 1946. The current ride was built in the mid 1960's. The Station, passenger loading structure, train barn, tunnel and bridge were all built at that time. The track is approximately 1 mile long. The track gauge (distance between the rails) is 18 ½ inches which is almost exactly 1/3rd the gauge (56 ½ inches) of standard, full-size railroads. This gauge is unique to our knowledge in the United States. Tunnel Ahead, Please remain seated. What will be waiting for us on the other side of the tunnel? Stanley Diamond at rest in the station. Our ride came to a finish as we pulled into the station. Click here for GP&S RR. Click back button on your browser to return to this page. After asking and receiving directions, we were backtracking on Crystal Springs Dr. going past the Los Angeles Zoo and the Autry National Center of the American West. Soon we were on Zoo Dr. and then pulling into the Los Angeles Live Steamers parking lot. We joined the others also waiting for the railroad to open and stood on a dirt trail that lead into the woods up the hill. I decided to take a stroll while waiting for the gate to open. Four legged and two legged animals are in this park. Tracks for display and work on the trains. Continuing their ride into the wild and woody Griffith Park. Walking back to the entrance, it was still a few more minutes before the opening. After entering we queued up to purchase tickets for our train ride. Passengers board under the covered platform. After boarding and getting seated on our car, we were soon off on our amazing thrilling train ride. No sooner than we had just left the station when it was time for "Watch your head" time. Platform for the members' use. After finishing our stimulating ride on the Live Steamers, we drove to the parking lot on the other side of the venue. Although only a few hundred yards away, there was no safe walkway to our next stop. This stop was my main reason for coming here on this the third Sunday of the month. Open on the third Sunday of the month. A plethora of curious items in the barn (a little more than the size of a two-car garage). And although my time here was short and there was much more to see, I will plan a return trip to see more. Steam engines on display next to Walt's Barn. Restored baggage car next to Walt's Barn. A nice small steam engine display, part of model train display. As this train continues on to its destination, we say good-bye to the L A Live Steamers and Walt's Barn. 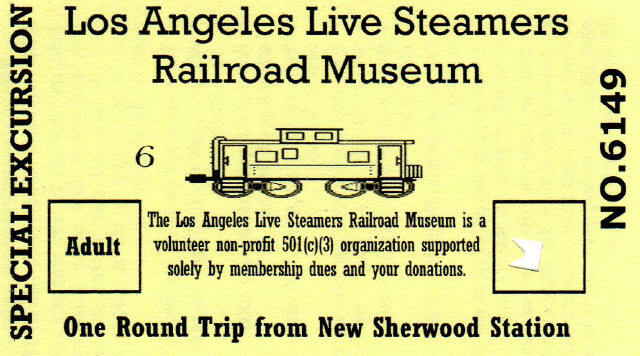 Click for Los Angeles Live Steamers. Click back button on your browser to return to this page. Leaving the parking lot we return to the L A Live Steamers side and their next door neighbor, Travel Town. Our arrival time at 11:30AM meant that the museum would be open by now. Travel Town is an outdoor transportation museum dedicated primarily to the history of pre-World War II railroading. It is an operational unit of the Griffith/Metro region of the Department of Recreation and Parks, and is owned by the City of Los Angeles. Travel Town was born in 1952, the invention of Recreation and Parks employee Charley Atkins. Charley was a big fan of railroading, and his original vision of Travel Town was as a haven of retired steam engines and interesting old railroad cars, and for an other antique transportation equipment that might be donated. Today, Travel Town is truly a museum in motion. Model railroads move in on the weekends, the miniature railroad ride cruises the perimeter daily, and they have full-sized equipment operating around the Museum grounds. So let's take a stroll around this campus and look at their equipment displays. Southern Pacific #3025. Built: 1904 by American Locomotive Company, Schenectady Works. 4-4-2. Santa Maria Valley #1000. Built: June 1920 by American Locomotive Company, Schenectady Works. 2-8-2. Southern Pacific # 1273. Built: September 1921 by Southern Pacific, Sacramento Shops. 0-6-0. Southern Pacific #1273. 0-6-0 (6-wheel switcher). Western Pacific #26. Built: 1909 by American Locomotive Company, Schenectady Works. 2-8-0. Stockton Terminal & Eastern # 1. Built: 1864 by Norris-Lancaster. 4-4-0. Pacific Electric #1544 "Electra." Built: 1902 by the North Shore Railroad. Wooden Iron Horses by Jackie Hadnot. Next I took a tour of several passenger cars on display, open for a walk through. Several cars on display were operated on Union Pacific's growing fleet of first-class passenger trains running between Chicago and the Pacific Coast, via the "Overland Route." In 1921, the Pullman Company completed an order of fourteen steel dining car for the Union Pacific Railroad; number 369 was the first car on the order. Each car featured table seating for thirty-six passengers in a posh surrounding of rich Mexican mahogany. The tables were set with crisp white linens, polished silver and sparkling china. The cuisine served was on par with the finest metropolitan hotels. In 1938, Dining Car 369 returned to the Omaha Shops where it was renovated for "Coffee Shop" service on The Challenger. As part of this renovation, the car's beautiful mahogany paneling was painted over, producing an interior which appeared less opulent and more in keeping with the clean lines and simple details of the newer streamlined cars. At this time, the Union Pacific was also renumbering all of its dining cars, giving the 36-seat cars 3600-series numbers and the 48-seat cars 4800-series numbers. Diner 369 became 3669. Dining Car 3669 is now undergoing a complete cosmetic restoration as part of the American Southwestern Railway Association's Rail Heritage Southwest Program at the Travel Town Museum. When completed, the restored car will be used as an interpretive educational exhibit, tracing the history of passenger rail travel in Los Angeles and the Southwest. The completed exhibits will include a wide variety of dining car china, silverware and other artifact from America's railroad past. The next car to visit was the Union Pacific Dormitory/Club Car (#LA-701) "The Little Nugget." The wonderful Mae West in Club Car. Dorm room made up for night time. Made up for day use. Some busy work while traveling on the Los Angeles Limited. Exiting the passenger cars, I headed over to the station to meet up with Chris and to ride the train. Adjacent to the station were two buildings. One was for the Fred Harvey exhibit. The other building housed tender vehicles that needed an enclosed locale. On the far side of the building was a glass enclosed room housing a model train layout. Now it was time to meet Chris and go for my train ride. As Chris had already ridden the train, I was to ride alone and he was going to take photos of me on the train. The train will make two loops on its track around the park. Patrons waiting to tour UP Dining Car 369. Today there was a high school band play off in this great venue. Atchison, Topeka & Santa Fe # 664. Built: 1899 by Baldwin 2-8-0. Having a picnic lunch in high style. After completing my ride on the train, I met Chris and we decided to call it a day and head home. After leaving the parking lot, we found the on ramp to the 134 close and nearby. Entering the 134 and then quickly entering I-5, we then headed south to Orange County. Click for Travel Town Museum. Click back button on your browser to return to this page. And so readers this is the last story and adventure of looking for Little Gems in Our Neighborhood. Chris and I both enjoyed our quest these past weekends for somewhat unknown trains so we urge all to get out and discover gems in your own neighborhood.